Definition at line 60 of file CommCalls.h. Definition at line 18 of file CommCalls.cc. Definition at line 23 of file CommCalls.cc. Definition at line 28 of file CommCalls.cc. Definition at line 34 of file CommCalls.cc. References conn, data, fd, flag, NULL, Comm::OK, and xerrno. 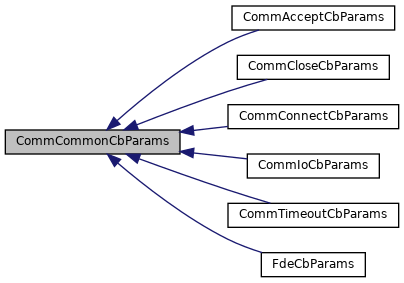 Referenced by CommAcceptCbParams::print(), CommIoCbParams::print(), CommConnectCbPtrFun::print(), CommCloseCbPtrFun::print(), CommTimeoutCbPtrFun::print(), FdeCbPtrFun::print(), and syncWithComm(). Definition at line 69 of file CommCalls.h. The connection which this call pertains to. On accept() calls this is the new client connection. On connect() finished calls this is the newely opened connection. On write calls this is the connection just written to. On read calls this is the connection just read from. On close calls this describes the connection which is now closed. On timeouts this is the connection whose operation timed out. NP: timeouts might also return to the connect/read/write handler with Comm::TIMEOUT. Definition at line 85 of file CommCalls.h. Referenced by Ftp::Server::AcceptCtrlConnection(), Ftp::Server::acceptDataConnection(), clientLifetimeTimeout(), ConnStateData::clientPinnedConnectionClosed(), ConnStateData::clientPinnedConnectionRead(), Server::clientWriteDone(), commSetConnTimeout(), Log::TcpLogger::connectDone(), Ftp::Server::connectedForData(), Ftp::Relay::dataChannelConnected(), Ftp::Gateway::dataChannelConnected(), CommConnectCbPtrFun::dial(), CommIoCbPtrFun::dial(), Server::doClientRead(), Comm::ConnOpener::earlyAbort(), IdleConnList::findAndClose(), Ftp::Gateway::ftpAcceptDataConnection(), gopherTimeout(), PeerPoolMgr::handleOpenedConnection(), Http::Tunneler::handleReadyRead(), httpAccept(), httpsAccept(), Snmp::Inquirer::noteCommClosed(), Mgr::Inquirer::noteCommClosed(), Adaptation::Icap::Xaction::noteCommConnected(), Adaptation::Icap::Xaction::noteCommRead(), Ipc::Port::noteRead(), Mgr::Inquirer::noteWroteHeader(), Ident::IdentStateData::notify(), Comm::TcpAcceptor::notify(), ConnStateData::pinConnection(), print(), Comm::ReadNow(), HttpStateData::readReply(), Ftp::Server::readUploadData(), ConnStateData::requestTimeout(), helper_server::requestTimeout(), ClientHttpRequest::sslBumpStart(), CommIoCbParams::syncWithComm(), Ftp::Client::timeout(), tunnelTimeout(), whoisTimeout(), Ftp::Client::writeCommandCallback(), Ipc::UdsSender::wrote(), HttpControlMsgSink::wroteControlMsg(), Ftp::Server::wroteEarlyReply(), and Ftp::Server::wroteReply(). Definition at line 74 of file CommCalls.h. Referenced by clientLifetimeTimeout(), Security::PeerConnector::commCloseHandler(), DeferredReadManager::delayRead(), CommConnectCbPtrFun::dial(), CommIoCbPtrFun::dial(), IdleConnList::findAndClose(), fwdServerClosedWrapper(), gopherStateFree(), gopherTimeout(), HttpStateData::httpStateConnClosed(), idnsVCClosed(), Ident::IdentStateData::notify(), print(), helper_server::requestTimeout(), tunnelClientClosed(), tunnelServerClosed(), tunnelTimeout(), whoisClose(), whoisTimeout(), and ~CommCommonCbParams(). Definition at line 90 of file CommCalls.h. Referenced by _comm_close(), comm_close_complete(), commCallCloseHandlers(), Security::PeerConnector::commCloseHandler(), commStartTlsClose(), Ftp::Client::dataRead(), Comm::IoCallback::finish(), fwdServerClosedWrapper(), HttpStateData::httpStateConnClosed(), Snmp::Forwarder::noteCommClosed(), Mgr::StoreToCommWriter::noteCommWrote(), Comm::TcpAcceptor::notify(), print(), Ftp::Client::readControlReply(), ConnStateData::requestTimeout(), Client::sentRequestBody(), CommConnectCbParams::syncWithComm(), whoisClose(), Ftp::Client::writeCommandCallback(), and HttpStateData::wroteLast(). Definition at line 87 of file CommCalls.h. 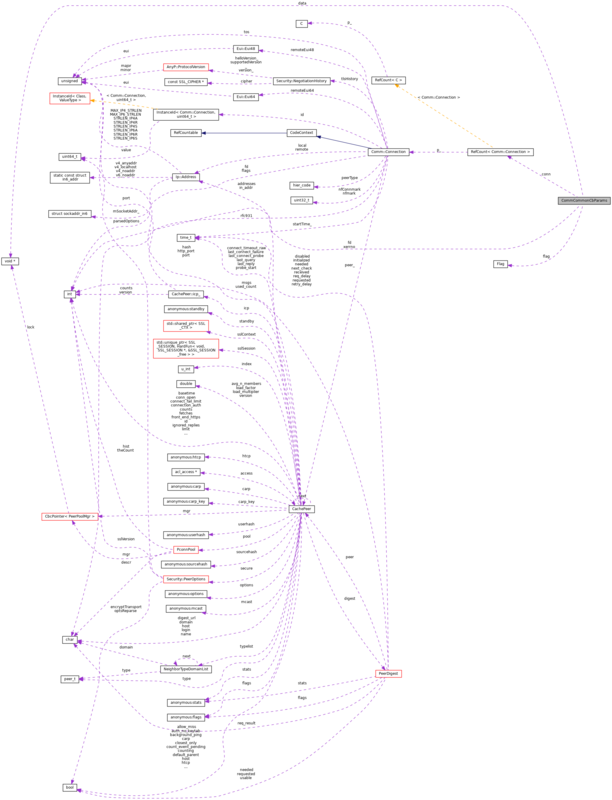 Referenced by Ftp::Server::AcceptCtrlConnection(), Ftp::Server::acceptDataConnection(), ConnStateData::clientPinnedConnectionRead(), Server::clientWriteDone(), Log::TcpLogger::connectDone(), Ftp::Server::connectedForData(), Ftp::Relay::dataChannelConnected(), Ftp::Gateway::dataChannelConnected(), Ftp::Client::dataRead(), CommConnectCbPtrFun::dial(), CommIoCbPtrFun::dial(), Server::doClientRead(), Ftp::Gateway::ftpAcceptDataConnection(), PeerPoolMgr::handleOpenedConnection(), Http::Tunneler::handleReadyRead(), Http::Tunneler::handleWrittenRequest(), httpAccept(), httpsAccept(), Adaptation::Icap::Xaction::noteCommConnected(), Adaptation::Icap::Xaction::noteCommRead(), Adaptation::Icap::Xaction::noteCommWrote(), Mgr::StoreToCommWriter::noteCommWrote(), Ipc::Port::noteRead(), Mgr::Inquirer::noteWroteHeader(), Comm::TcpAcceptor::notify(), print(), Ftp::Client::readControlReply(), Comm::ReadNow(), HttpStateData::readReply(), Ftp::Server::readUploadData(), Client::sentRequestBody(), ClientHttpRequest::sslBumpStart(), CommIoCbParams::syncWithComm(), Ftp::Client::writeCommandCallback(), Log::TcpLogger::writeDone(), Ipc::UdsSender::wrote(), HttpControlMsgSink::wroteControlMsg(), Ftp::Server::wroteEarlyReply(), HttpStateData::wroteLast(), Ftp::Server::wroteReply(), and Ftp::Server::wroteReplyData(). Definition at line 88 of file CommCalls.h. Referenced by Ftp::Server::AcceptCtrlConnection(), Ftp::Server::acceptDataConnection(), Ftp::Relay::dataChannelConnected(), Ftp::Gateway::dataChannelConnected(), Ftp::Client::dataRead(), CommConnectCbPtrFun::dial(), CommIoCbPtrFun::dial(), Server::doClientRead(), Comm::ConnOpener::earlyAbort(), Ftp::Gateway::ftpAcceptDataConnection(), Http::Tunneler::handleReadyRead(), Http::Tunneler::handleWrittenRequest(), httpAccept(), httpsAccept(), Adaptation::Icap::Xaction::noteCommRead(), Comm::TcpAcceptor::notify(), print(), Ftp::Client::readControlReply(), Comm::ReadNow(), HttpStateData::readReply(), Client::sentRequestBody(), Ftp::Client::writeCommandCallback(), Log::TcpLogger::writeDone(), HttpControlMsgSink::wroteControlMsg(), Ftp::Server::wroteEarlyReply(), HttpStateData::wroteLast(), Ftp::Server::wroteReply(), and Ftp::Server::wroteReplyData().